OMG have you guys seen this yet? 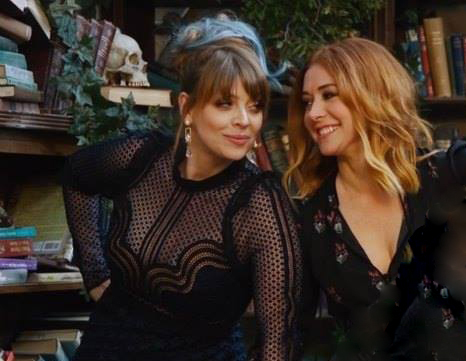 How much do I love that Amber and Aly are close in both the full cast pic and the one with them and Seth?!!? YES!! The Kittens are losing their minds on the Kitten FB page"Kisses and Gay Love"
Laragh edited the EW video down to just the interview with Amber and Aly. It's like goddamn carnivale over there!! Came over to give the KB some love in all the madness! Oh Jesus, I thought I'd never see something like that. And I was pretty sure I wouldn't be affected if i did. Wrong. My first loves. sigh. I had to make these. xita why are you doing this to me??? I was already completely preoccupied with that looking-at-each-other pic and I'm officially dead now with that gif. It's amazing how the only thing that can cure the ultimate broken heart is these two. Wow. Chemistry, that's it, right there. OMG... that gif! THAT GIF! Glad all the madness made it over to the board properly. Haven't been here in many moons. But, I had to come here and swoon over the hotness of Amber and Aly! I had no idea there was a Facebook group! That's awesome! I've requested to join the fun over there. And because I'm always late to things..... everyone saw the 45 min video, right? I found this way after my normal bedtime and was of course up for a looooong time flailing over them. Chemistry doesn't just go away, I guess. I love that with all these couples on tv now, there's still nothing quite like them. So unique looking, not generic at all. And never mind the personalities, really well drawn out characters. I can't get over how ... hell, I don't even know ... genuine maybe? How genuine that chemistry still is, how real it feels to see it again, how wonderful all these resurfacing emotions feel, like finding your favorite childhood toy in the closet or a box. Wow. xita called it her first love, and that's exactly it for me too. I'm remembering those feelings from the first days when I discovered them and this place and fell in love with everything they were and are. I'm bubbling with the memories of experiencing something that brought pure joy. I'm experiencing it like it's fresh all over again. It runs deep and reminds me just how much representation still matters. And how we need to keep fighting to have positive stories told. On that note, I'm going to go grin like an idiot at two women smiling at each other and not feel one bit bad about it. This is how magical this was, so many now cannot recreate this with all the things allowed now. Our subtextual courtship was subtle but it was in the power of the stare. I will never forget watching Hush and all of us watching new, they didn't say a freaking word. Those of us who saw it were overwhelmed with the power of this chemistry. I like the word genuine. And yeah, resurfacing emotion. Yep. It makes me want to write. I'll overshare, when I found them, I was in a rotten long term relationship. I didn't realize how bad it was. Clearly, I looked to Willow and Tara for this love. I have changed so much. I am a full grown up now. I am a home owner, married, in an 11-year relationship to the best woman in the world. But seeing them now as women, as 40 year olds, like myself. I don't know. i can finally relate to them differently. What could have been, I know exactly what that would have looked like for them. I thank everyone involved even Joss. I always feared he would never allow us this... so i never dared even hope. But seeing them now as women, as 40 year olds, like myself. I don't know. i can finally relate to them differently. What could have been, I know exactly what that would have looked like for them. Xita, exactly! Just last week I was thinking how amazing it would be to just see them together, side-by-side, as they are today. Like you, I never really thought it would happen. And now, an embarrassment of riches. Similarly to you, I first found W/T after the end of a really awful relationship. W/T represented what a relationship could be, even should be. I latched on to them like a desert rat, desperate for water. They inspired me and gave me hope. And the fact that the chemistry was so, so... genuine (yep, gorn, perfect word), made it that much more real and wonderful and beautiful. The fact that the chemistry remains is like a gift we didn't know we needed. So now, here I am, not quite 40 (but closing in), married to a wonderful woman who I've been with for 10+ years and knowing that "happy endings" do exist for us (LGBTQ+). It's nice to see photographic/video evidence that they can exist for our favorite ladies as well. I think anyone who objects to that is probably in the wrong corner of the web! A new banner would be awesome but I think it should be mostly about Willow/Tara. 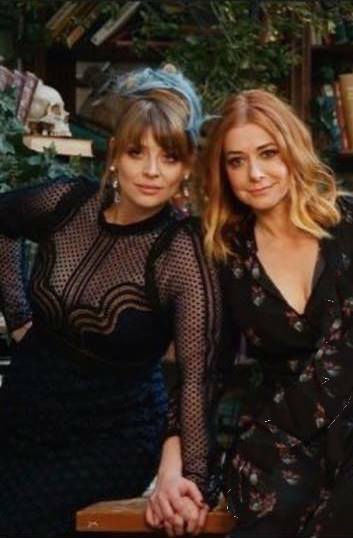 Maybe switch one pic of Amber and Aly with one of W/T to balance? You could also add the gif you made from the Amber and Aly interview to the three at the bottom of the page. Yup.. the chemistry is still there. Amazing! See to me, they are in Willow and Tara attire, they are supposed to be Willow and Tara. Like, that isn't Amber and Aly. I think for the bottom, I am thinking it's time for some actual gifs. I am a pretty good gif maker now, so I can def. add that one to the bottom of the board and maybe gif some of the kisses. I'll take requests for that. I'll definitely be changing my skin back to take advantage of that! My favourite kiss was always the one where they come downstairs at the beginning of Seeing Red and Dawn says 'you better not' (stop). I think we were all Dawn in that moment. But I just thought it was super cute how they looked at each other and how Tara touched Willow's face. It's only about 3 seconds but it just gives me the warm and fuzzies. That's a great point --it sure did feel that way watching the interview. There are our girls.. many years later living happily ever after! Also.. the new banner looks awesome on the OG Kitten background. Excellent job on the banner and the gif. I'd love to see the gif added to the bottom, Thanks!! Yay for a new banner! Totally agree that they were dressed and *acting* as W/T in the photos. Yay!! Middle-aged W/T! And as for new gifs on the bottom... maybe... slow-mo kissage? If that's possible? Trust me, they'll look much better than what we have. I am much better. Oh I guess I can also crop the one one I made in this thread. Slo-mo either the Body kiss or Entropy?